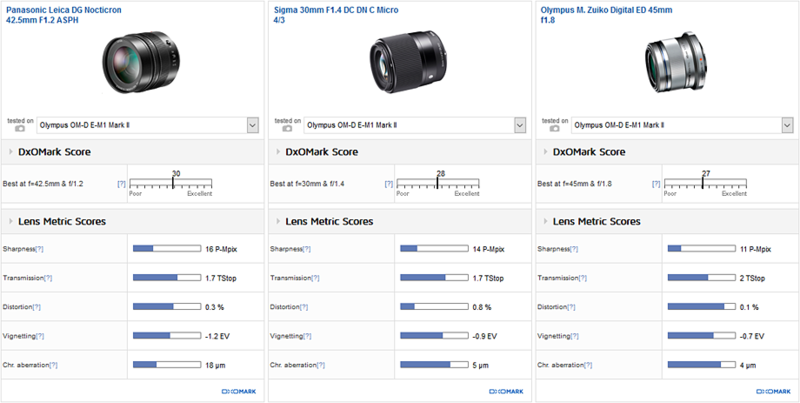 The choice of lens also plays a significant role in the overall image quality recorded, however, and our analysis of camera-and-lens combinations provides valuable insight into the performance and image quality of different mirrorless configurations. We’ve tested a total of 42 lenses on the E-M1 II, including 22 primes and 20 zooms, covering focal lengths from an ultra-wide 7mm through to a super-long telephoto 300mm. Taking into account the MTF x2 “crop factor,” this equates to equivalent focal lengths in 35mm terms covering 14mm to 600mm. Part 1 of our best lenses for the E-M1 II looks at the performance of prime lenses, with MFT lens-mount options from Olympus, Panasonic and Sigma all being put through their paces in our lab. Scores range from a high of 31 points on the Olympus M.Zuiko 75mm f/1.8 telephoto to a low of 7 points on the Olympus 15mm 1:8.0 body cap lens. 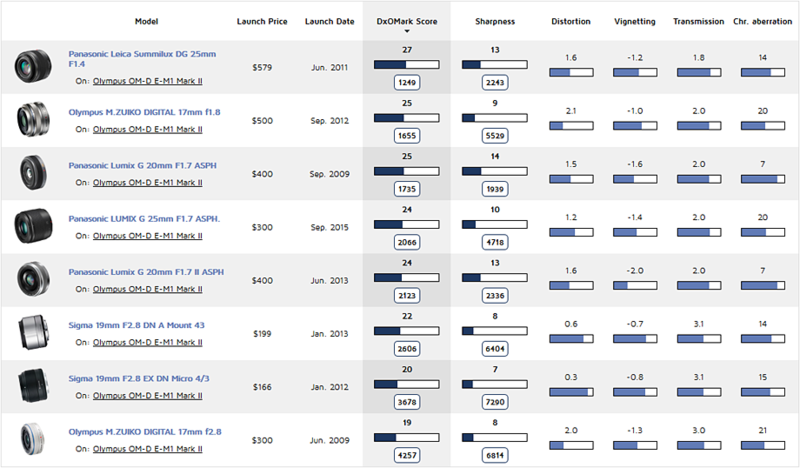 We’ve grouped the primes into four categories: wide-angle, standard, short telephoto, and long telephoto. We take an in-depth look at the top three performers in each category, highlighting their strengths and weaknesses. An important lens for shooting high-quality landscape and architecture photos, or simply when shooting in restricted spaces, we’ve defined wide-angle primes for this review as having a focal length up to 15mm (equivalent to 30mm in full-frame terms). 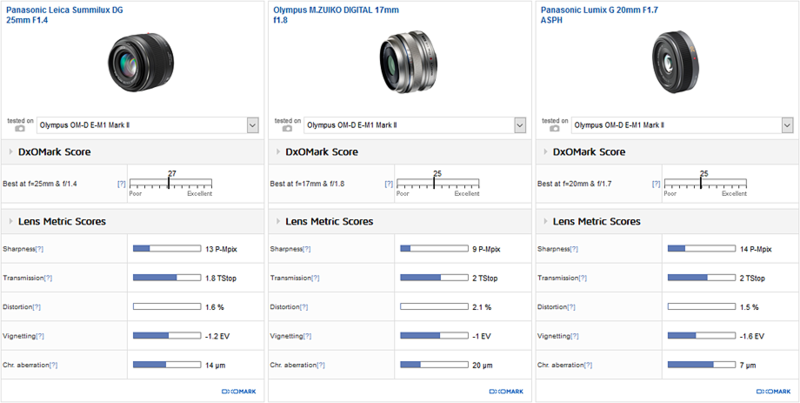 Overall DxOMark scores range from a high of 26 points on the $599 Panasonic Leica DG Summilux 15mm f/1.7 ASPH (Panasonic 15mm f/1.7) to a low of 7 points on the $49 Olympus 15mm 1:8.0 body cap lens (Olympus 15mm f/8). Sandwiched between these two, the $649 Olympus ED 12mm f/2 (24mm equivalent) is arguably the better prime option for shooting landscape or architectural photos on the E-M1 II, offering a wider field of view and scoring 25 points, just fractionally behind the Panasonic 15mm f/1.7. For those who want to travel super-light, the ultra-slim 15mm body cap is not really like having a lens on at all. So it’s pretty basic, with no aperture blades, a fixed f/8 aperture, and only 3 small lens elements with a manual focus lever to adjust their position to focus. It’s convenient for some situations, but optical performance is far from outstanding, with some quite heavy vignetting at –1.5EV and noticeable chromatic aberrations in the outer field. The Olympus 15mm f/8 also has relatively poor sharpness, dropping below 40% in the outer field, and although it’s much better in the center, this covers only a small part of the image field. 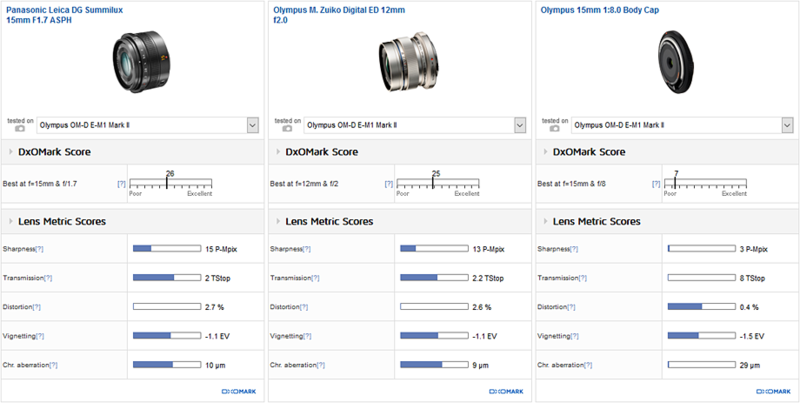 Performance and lens metrics between the Panasonic 15mm f/1.7 and Olympus ED 12mm f/2 are very similar, with both boasting excellent light transmission, providing plenty of light for the E-M1 II’s electronic viewfinder, and good low-light performance. As is common for wide-angle lenses, both suffer from some distortion at 2.6%, with very noticeable barrel curvature that would benefit from some post-production correction for straighter lines. The heaviest vignetting of –1.1EV occurs when using either lens at its maximum aperture setting, and although neither is completely free from corner shading at any aperture, the issue is significantly improved between f/2.8 and f/22 — down to just –0.3EV. Chromatic aberrations are also well-controlled on both lenses, and not a problem at any setting, except when shooting wide-open on the Panasonic 15mm f/1.7, where some very slight fringing is evident in the outer field. Sharpness on the Panasonic 15mm f/1.7 is a little soft at f/1.7, down to around 60% acutance in the field. Resolution is much improved between f/2.8 and f/8, however, where it offers good uniform resolution, and it achieves peak sharpness of over 70% acutance in the field at f/4. The Olympus ED 12mm f/2 is not truly uniform at any of the wider aperture settings between f/2 and f/8, but it records good center sharpness around 70% acutance in the center of the frame, dropping only slightly to around 60% in the outer field. The diffraction effect reduces overall levels of resolution on both lenses at their narrower apertures from f/11 — down to around 50% acutance on the Panasonic 15mm f/1.7 at its minimum f/16 aperture, and 45% on the Olympus ED 12mm f/2 at f/22, which is worth bearing in mind for long depth-of-field landscape or architectural shots. Standard focal length prime lenses offer a versatile field of view for shooting a variety of subjects and for general use. They also offer “fast” apertures for low-light photography and creative bokeh effects, in an often reasonably small and affordable unit. We’ve tested eight standard prime lenses on the E-M1 II, with equivalent focal lengths ranging between 34mm and 50mm, and scores ranging from a high of 27 points on the Panasonic Leica 25mm f/1.4 to a low of 19 points on the Olympus 17mm f/2.8. The top three all boast fast maximum apertures, but a range of different focal lengths, so there’s a good option regardless of what your preferred standard is. Top of the tree is the $598 Panasonic Leica DG Summilux 25mm f/1.4 (Panasonic 25mm f/1.4) with 27 points, followed by the $499 Olympus M.Zuiko 17mm f/1.8 (Olympus 17mm f/1.8) and the pancake-style $298 Panasonic Lumix G 20mm f/1.7 ASPH (Panasonic 20mm f/1.7) both with 25 points. 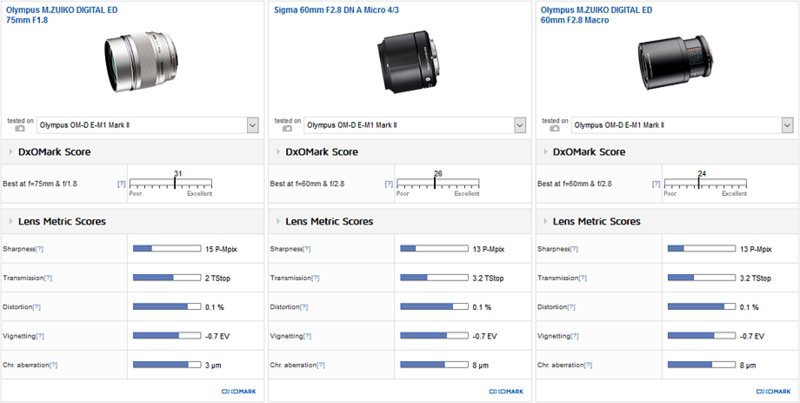 Light transmission is broadly the same for these fast-aperture primes, resulting in the close overall scores and similar low-light performance. There’s also some noticeable barrel distortion on all three, which is slightly more curved on the wider 17mm (as you’d expect), but all would benefit from some correction for straighter lines. Despite a headline vignetting score of –1.1EV for the Panasonic 25mm f/1.4, this was recorded at its maximum f/1.4 aperture setting, and actually, it handles corner shading best of the three, with clean results from f/2. In comparison, the wider-angle Olympus 17mm f/1.8 and Panasonic 20mm f/1.7 continue to vignette a little at all aperture settings, although at below –1EV between f/2.8 and f/16, it’s not overly problematic. Chromatic aberrations are a little more worrisome on the Olympus 17mm f/1.8, however, with some noticeable fringing in the outer field at all aperture settings. Although the Panasonic 25mm f/1.4 doesn’t seem far behind on the headline score, aberrations on this class-leading standard prime are restricted to the far corners, and as such shouldn’t have too detrimental an impact on your images. The Panasonic 20mm f/1.7 fares best overall for chromatic aberration, however, with no noticeable fringing at any aperture. The Panasonic 20mm f/1.7 achieves the highest overall sharpness score, offering just about the most uniform results at the maximum aperture. At f/2, it offers improved center resolution as well, although the corners are similar to those at f/1.7. The Panasonic 20mm f/1.7 records peak sharpness of around 70% acutance, with uniform results to the corners, between f/4 and f/5.6, and its resolution holds up slightly better at the narrower apertures compared to the competition, too. The Panasonic 25mm f/1.4 hits peak, uniform sharpness, over 70% acutance in the field between f/2.8 and f/4. At its wider f/1.4 and f/2 maximum apertures, resolution remains strong in the center of the frame, with slightly softer edges (particularly true at f/1.4). The Olympus 17mm f/1.8 records slightly lower overall resolution, achieving peak and uniform sharpness of around 65% acutance at f/4. Using wider apertures, sharpness is broadly the same acutance in the center of the frame, albeit with slightly softer edges, and acutance drops to around 60% or below using apertures f/5.6 and smaller. Short telephoto focal lengths for MTF shooters range between 30mm and 45mm (60mm and 90mm equivalent), with some fast-aperture options available for portraits and low-light shooting, as well as macro options for close-focus photography enthusiasts. We’ve tested eight such lenses on the E-M1 II, with scores ranging from a high of 30 points on the Panasonic Leica DG Nocticron 42.5mm f/1.2 ASPH (Panasonic 42.5mm f/1.2) to a low of 11 points on the Olympus M.Zuiko 35mm f/3.5 Macro. 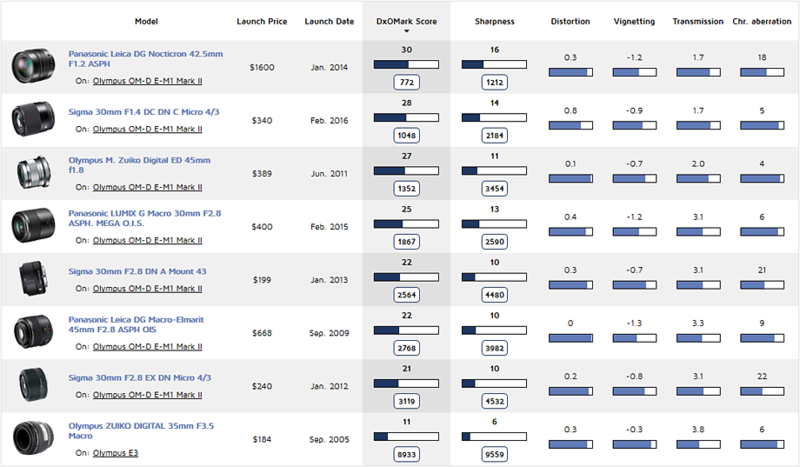 The top three include some very fast maximum apertures, notably the top-ranked $1398 Panasonic 42.5mm f/1.2 with 30 points, as well as the cheaper $339 Sigma 30mm f/1.4 DC DN with 28 points, and the $399 Olympus ED 45mm f/1.8 with 27 points. In fact, the Panasonic 42.5mm f/1.2 is the fastest-aperture prime we’ve tested for the E-M1 II and ranks first for sharpness, making it a great option for your portraits. Its low-light credentials are further boosted by the inclusion of Panasonic’s lens-based optical image stabilization, but this is a little superfluous when used on the E-M1 II, thanks to the camera’s in-body 5-axis image stabilization. As you’d expect, all three offer excellent light transmission and low-light performance. The wider focal length Sigma 30mm distorts the most at 0.8%, with some noticeable barrelling evident. The heaviest headline vignetting score of –1.2EV on the Panasonic 42.5mm f/1.2 is due to its super-wide maximum aperture, but actually all three top short -elephoto primes display very little corner shading from f/1.8 onward. There’s no problematic chromatic aberration on the Sigma and Olympus lenses either, but the Panasonic 42.5mm f/1.2 falls down a little here, with some noticeable edge fringing evident at all apertures – although to be fair, the heavy fringing is restricted to the far corners. Long telephoto zooms offer even greater reach, with fairly fast maximum apertures making them a useful optic for sports and action, as well as for portraiture and macro photography on the E-M1 II. We’ve tested three long telephoto primes with 60mm or 75mm focal lengths (120mm and 150mm equivalent), and scores range from a high of 31 points on the $749 Olympus ED 75mm f/1.8 to a low of 24 points on the $499 Olympus ED 60mm f/2.8 Macro. The fast f/1.8 aperture and improved light transmission on the Olympus ED 75mm f/1.8 offers the best low-light performance, and this revered M.Zuiko lens is the highest-scoring lens we’ve tested on the E-M1 II. Close-up macro photography at fairly long focal lengths can produce some interesting results, with exaggerated shallow depth of field, and the $499 Olympus ED 60mm f/2.8 Macro is an affordable option on the E-M1 II. Sigma’s 60mm f/2.8 DN is the budget option at just $239, and a good choice for headshot or portraits, thanks to its 120mm-equivalent focal length and f/2.8 maximum aperture, but it has no macro focusing. 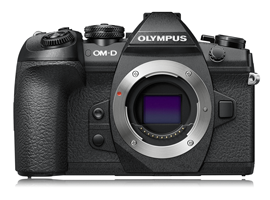 Scoring 15 P-Mpix for sharpness, the Olympus ED 75mm f/1.8 is one of the best-resolving lenses we’ve tested on the E-M1 II and hits peak uniform sharpness of over 70% acutance in the field at f/4. For very shallow depth-of-field portraits, it also offers good sharpness at f/1.8, around 65% acutance in the center and a little softer at the edges, but at f/2.8 it’s more uniform across the frame, with good sharpness approaching 70% acutance. The Sigma 60mm f/2.8 DN is relatively uniform at all apertures, with good levels of resolution between f/2.8 and f/8 and peak sharpness of over 70% acutance at f/4. There’s a similar sharpness pattern for the Olympus ED 60mm f/2.8 Macro, which resolves best between f/2.8 and f/8 ,with peak sharpness approaching 70% at f/4. It’s not truly uniform at any of the wider aperture settings, however; and although resolution is a little more consistent across the frame using narrower apertures between f/11 and f/22, overall levels of sharpness are lower at these apertures. Resolution at narrower apertures usually reduces somewhat due to diffraction, and is to be expected with many lenses, but perhaps it’s a little more significant with the Olympus ED 60mm f/2.8 Macro, if you’re looking to shoot longer depth-of-field macro shots at f/22. As you’d expect, there’s virtually no distortion evident using any of these longer focal length telephoto primes, and it’s the same with vignetting, with fairly mild corner shading of just –0.7EV using the maximum aperture, which is eradicated by closing down a stop.